I decided to get a new monitor the LG IPS224V-PN and I like it quite a bit. Ultimately I choose the cool temperature. The power buttons is a large half-circle with a bright, refracting light. 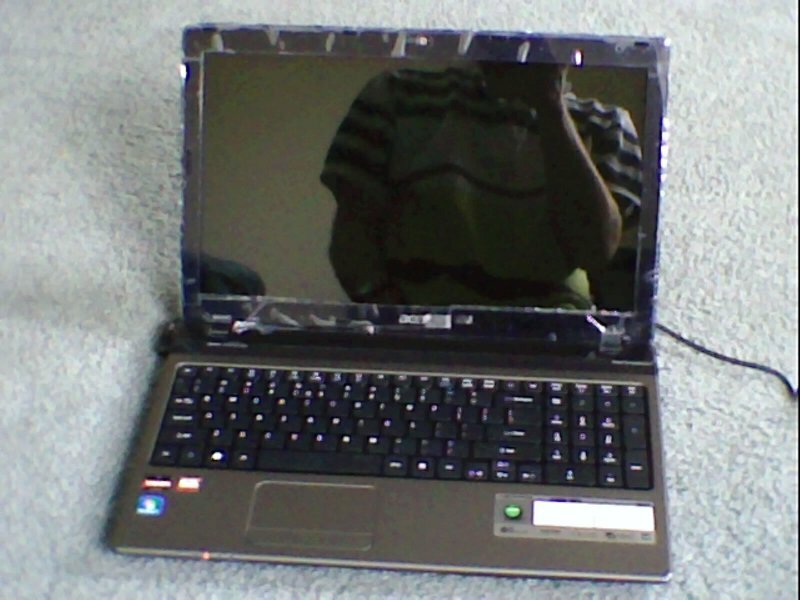 It is very noticeable and flashes when the monitor is in power-saving mode. It is real nice but if it is in the bedroom, like mine is, I ended up having to cover it up. The monitor has IPS and it really does help improve the viewing angle and accurate color reproduction. I got this display for reading and it is good with that. It also is good with pictures at least as far as my mostly-professional eye is able to see. The 14ms response time, I think, is a bit on the high end for video watching. Videos will show a bit of “ghosting” but is good enough for me. 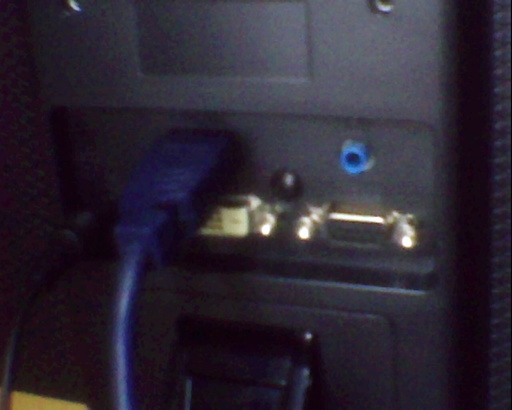 This entry was posted in Hardware, Linux on 2014-02-14 by Todd Partridge. Typically it hasn’t been recommended to buy an Acer, at least in my circles. From the surveys I’ve seen generally Acer rankings are last of the major computer manufacturers. Astonishingly they rank close to the top of units sold. When I saw this, I deduced that Acer likely made possibly shabby computers sold at basement-prices to a portion of the population that was virgin. 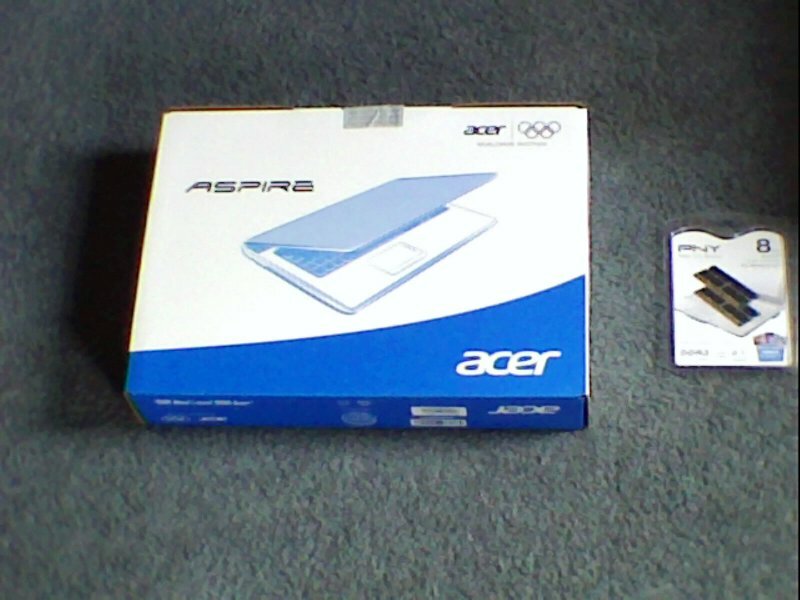 So I’m not sure what I was thinking when I bought my Aspire laptop except, “If that’s true, thats a really good price; I have to have it.” I had been using a ten-year-old laptop up to now so this was by best shot to the moon orbit. All this for $550 dollars from TigerDirect. 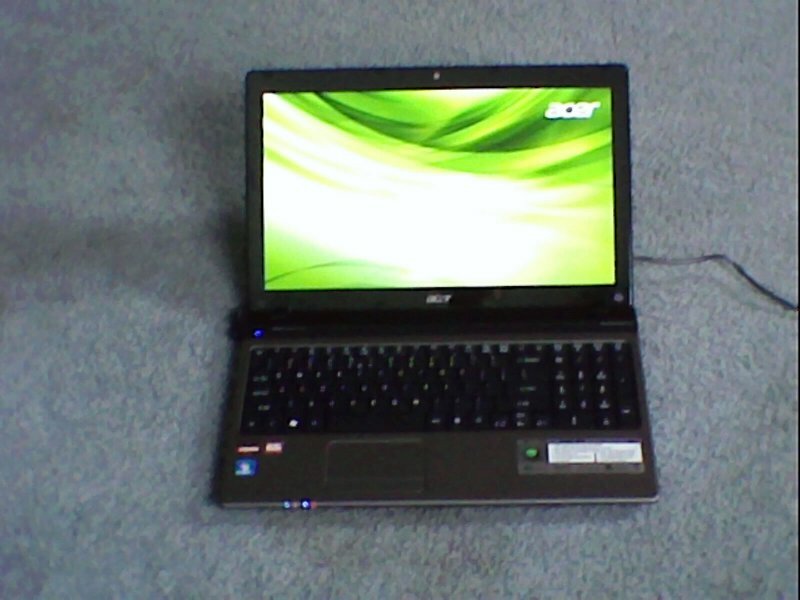 The closest comparable model was from HP for $750. I was really recommended to change the RAM speed so this was the first thing I did. Along with the laptop I bought a two stick pack of PC106-1333 8GB memory from PNY for $41 dollars only to have it be non-compatible (or I guess it could have been busted [but passed memory test]). After that I got it from crucial because of their Guaranteed-compatible promise and the speedup is noticeable. I admit that I got the 5560G because of the graphic card to be able to play games, it was extremely appealing to me. The Notebookcheck tests on it seemed to me to be real good for a mobile graphic card. I was able to get into Dungeon and Dragons Online and the playability was good with the auto-detected medium-high graphic settings. Been thinking about SWTOR, hmm. I’ll probably one day get a Solid state Drive down the road for it, the 5400 hard drive speed is definitely hard to miss at times. The one from crucial sounds pretty appealing, at $170 dollars though ughh, and I’m not sure I can live with 125GB. The screen is nice and bright and seems to have good color replication though it does have a limited-gamut and viewing angle (a typical 1366 x 768 these days I’m told). It uses an LED which is nice; glossy, not so. Having it be so reflective worried me at first I was real surprised though when I turned it on how it made that shiny virtually indistinguishable. Keyboard and touchpad feel good. The keyboard is full-size and key pushes offer an easy, uniform resistance. I really like the touchpad. The surface provides a nice bit of friction for feedback and the size fits really well. Wish manufacturers would get away from touchpad tapping on as default however (be nice if even there was a hardware way to turn it off). The look and balance is nice as well (if you can’t tell the look from the photos). Doesn’t weigh too much and doesn’t feel off-kilter like other laptops I’ve experienced. The hinge is sturdy and pivots nicely. Site note first: I can’t believe I am saying it but I like Windows7. It’s well put together and has good help. Out of the box everything worked pretty well. What can I say though, I like hacking; plus I love open-source. I’m not sure how I got so lucky buying this but after installing Linux everything just worked. This entry was posted in Gaming, Hardware, Laptop, Linux on 2012-04-05 by Todd Partridge. I decided to sell my desktop computer and use my laptop exclusively, I had no need to keep another computer and since I was only using it for doing backups I decided it would be better to save some space. I choose to get a Western Digital because they have been so reliable to me in the past. Of the external hard drives available at Wal-Mart it initially appeared not the be the best value. A Seagate right next to it was also a terabtye in storage capacity but also had USB 3.0 capability for only $15 dollars more. The WD Essentials has only USB 2.0 and I know that 3.0 is supposed to be considerable faster than 2.0. However, for me, my laptop is only USB 1.0 so this didn’t factor into it; also, because I am only using this for backups, time isn’t much of a factor and I prefer to have the reliability of the Western Digital name. The My Book Essential HD has a capacity meter on the front to display how full the disk is. I learned though, unfortunately, that this only works through the Windows driver and using the NTFS file system. Because I’m going to be using this for backups on Linux with ext4 this feature isn’t available. Since I have a Windows system installed I retrospectively learned that it is a good idea to install the driver/software for the drive there to setup the drive for only the reason so that I could disable the VCD. The Virtual CD Drive is a built-in memory chip that registers to the operating system as a regular CD drive. On it it contains the driver/software installer and manual. As far as the driver/software goes its nicer than I’ve seen of other hardware’s software, it was lightweight, easy to use, and with no frills. For Linux though the driver/software is unecessary as it is automatically recognized and working out of the box. I disabled the VCD drive with the Windows software though to keep the VCD from popping up when I loaded my Linux desktop. I ran a S.M.A.R.T. conveyance test and extended test on it then did a thorough badblocks write test that took about 24 hours… all tests passed. 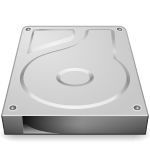 Formatting to ext4, the drive works perfectly in Linux without any additional configuration (besides noatime. I’ve been using the hard drive the last couple of months and I’m real happy with it: it’s small, quiet, and has done it’s job without a hitch. This entry was posted in Hardware, Linux and tagged external hard drives, linux desktop on 2011-12-26 by Todd Partridge.